The Assault Cannon as it stands is really nothing more than a massively beefed up Storm Bolter. According to some background sources, that's exactly what it started out as. 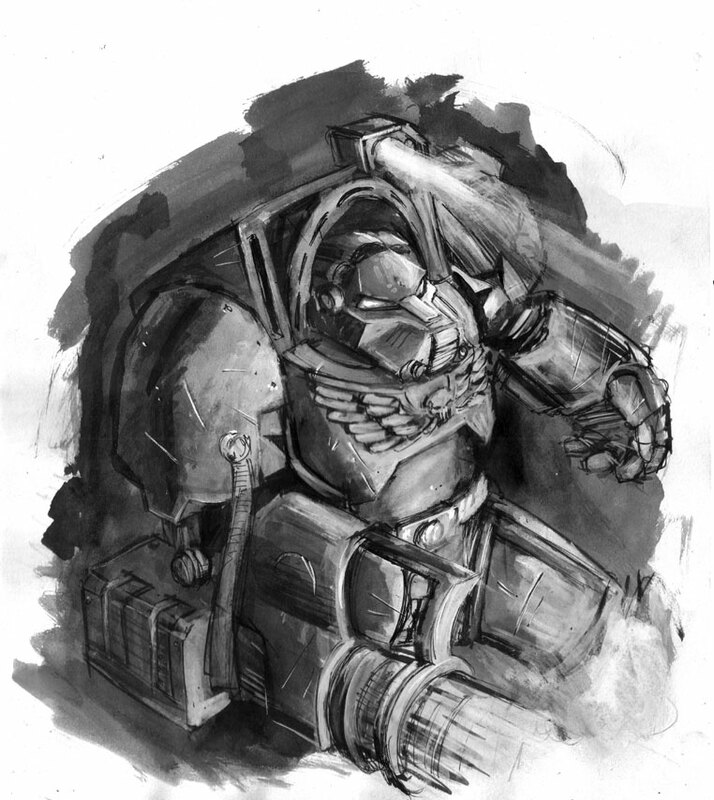 The true history is both shrouded in mystery and lost to time as most everything in the Warhammer 40k universe is. 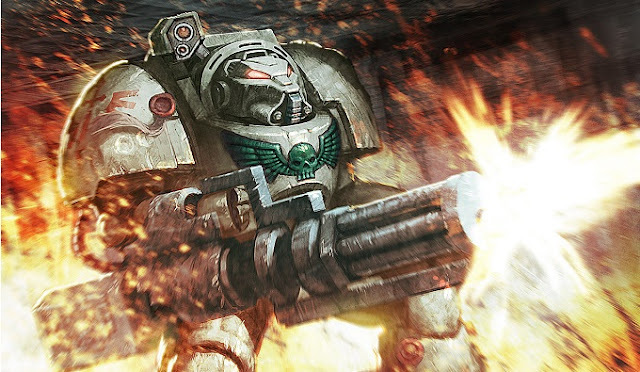 In Space Hulk, the beefed up "power" of the Assault Cannon is represented by rolling one extra D6 for shooting along with an improved chance to hit the target as compared to it's smaller family member, the Storm Bolter. Makes sense at first, but on closer inspection, it falls apart. Here we have another case of keeping the rules simple. Just like before with the blast weapon effects. This is understandable given the nature of the game and what GW was trying to accomplish overall. Changing the blast rules was no problem at all, so tackling the Assault Cannon seemed like the perfect thing to do next. So how do the cannon's rules fall apart? Let's break it down and look at the parts. 1. The extra D6 when shooting. Seems to fit since the weapon fires in burst mode and puts out hundreds of rounds with each pull of the trigger (in theory). Far more than a Storm Bolter (our base weapon we're comparing this too) so the extra D6 makes complete sense. Again, seems to work here as well since we're putting hundreds of rounds in the air. We're bound to hit something. But wait... if we're putting hundreds of rounds down range with each trigger pull, shouldn't we be chewing apart everything in front of us? This is where the issue comes up. The rate of fire is tremendous, the power is insane. It grinds through ammo in the blink of an eye and yet we can only hit one enemy model when we fire? You mean to tell me that that despite the insane volume of firepower we can put out with this thing, the most we're ever going to kill is one single Genestealer? That's no better than a Storm Bolter. No wonder the Heavy Flamer is the standard "go to" weapon for your basic squad! Simple. We reinstated two rules. One from first edition and one from second edition. To do this, the Marine equipped with the Assault Cannon must have at least five bursts remaining in the magazine. Any less and he may NOT use this mode. If he has enough, he can declare he is firing in "full auto" before rolling and it's resolved in the following way. Every single target to include Marines, doors, Genestealers, etc. that is within range and LOS will be fired at one time. The shooting is resolved using 3D6 like normal and targets are hit on a 4+ instead of the normal 5+. Some will live... most are going to die. If a target dies and a new target is exposed that is both in LOS and range, that new target is also fired upon. This process continues until all targets in LOS and range of the weapon have been fired at one time. The entirety of his ammo is depleted, it doesn't matter if he only had five bursts, all ten or any amount in between when he started (remember the minimum is five bursts to use "full-auto" mode). Firing in "full auto" uses all of the remaining ammo and the Marine will need to reload the Assault Cannon like normal before firing again. This is where the Assault Cannon really shines in my opinion and makes it a contender for inclusion in the squad over the standard Heavy Flamer. Sure the Heavy Flamer can block off areas with fire, but using this option really adds some teeth to the cannon. It still rolls to hit with all the normal rules, but you count each successful hit as opposed to just looking for one successful hit out of the total dice rolled. For example, without Firestorm, you could roll 2 successful hits, but still only kill one Genestealer. With Firestorm, the same roll of two successful hits would kill TWO Genestealers. The only restriction to this is that ALL additional targets killed by Firestorm must be in an adjacent square to the original target and in LOS and range of the Assault Cannon. It makes it a monster. The monster it should be when it comes to shooting. Using the Full Auto option is amazing, but dangerous at the same time. You really need to use that option judiciously when you know it's going to count. Firestorm brings the power level up overall and gives the weapon the ability to do what the history describes it being capable of doing. If you still haven't changed the way you use blast weapons, read this! Image credits: Top Illustration by unknown artist. Spot Illustration by madscuzzy. Cannon profile by Games Workshop.